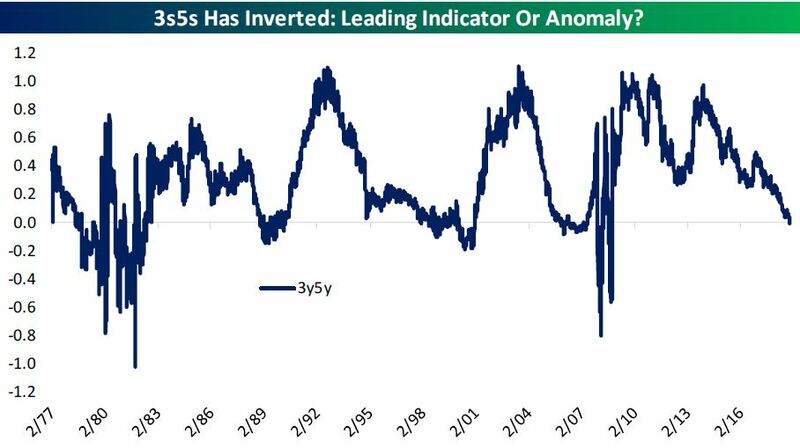 Bespoke studied what happens when short-term interest rates rise above longer-term rates and found that when the 3-year and 5-year spread inverts, as it did Monday, other spreads soon follow, and so does a recession. In the last three recessions, the curve of the 3-year and 5-year had inverted an average 26.3 months before the recession. The worst stock market performance is not when the yield is inverting, but after it begins to steepen again, according to Bespoke. Bespoke said in the last three recessions, the first inversion — between the 3-year and the 5-year came an average 26.3 months before the start of a recession, with a range between 17 and 38 months. In all three cases, the 3-month to 10-year yield curve inverted for the first time an average 89 days later, or between 19 and 173 days. The 2-year yield Tuesday was just about 13 basis points away from the 10-year yield, while the 3-month yield was about 55 basis points from the 10-year. Bespoke noted that a move to inversion on the latter would require either a significant rally in the 10-year, or two more rate hikes from the Fed. Paul Hickey, co-founder of Bespoke, said when the spread on the 3-month to 10-year is between 50 and 100 basis points, the stock market tends to perform well. "The flatter it gets, the worse it is for the market. Even worse for the market is when it's below 50 and already inverted," he said. "When you get the worse performance is after it inverts and gets positive again, and that's when you really see the market weaken," Hickey said.